The Chop Shop is billing itself as the old NoDa reborn: a bar/concert venue/art space housed in an old warehouse on the wrong side of the tracks. Its an intriguing bit of marketing. NoDa, after all, has become more and more gentrified and staid over the years. As is so often the case in developing cities, the hip arts district has drawn young professionals who want to live in a hip arts district, except, you know, without all the weirdness, the noise, the artists. Anyone attempting to throw a wrench into this slow but steady march toward utter blandness should get bonus points on effort alone. The Chop Shop opened its doors to the public on Friday and Saturday, May 13 and 14, for a weekend celebration designed to give the neighborhood an idea of whats in store between its warehouse walls. I dropped by Saturday to see the space and festivities for myself. The first thing I noticed was the places potential. Its a large space  17,000 square feet to be exact  with one of the bigger stages in town. Two movie screens sit on either side of the stage, allowing for multimedia events. 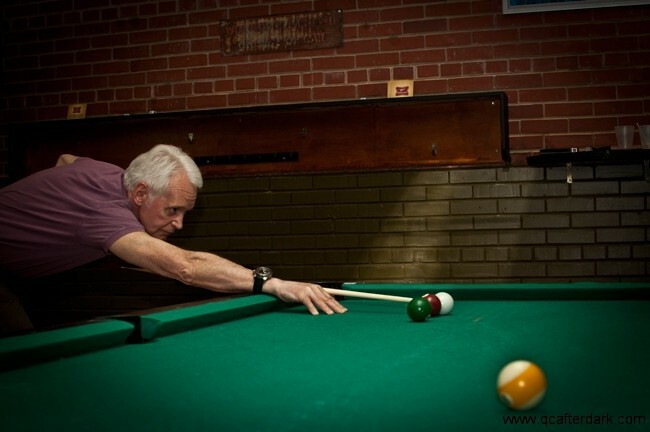 There are a couple of pool tables and dart boards as well, which is nothing new but due to the spaces open layout allows patrons to play while still maintaining a good view of the stage. The theme is carried out in a more dedicated fashion than is seen in most themed venues. They didnt simply slap a bunch of old Harley ads on the walls and call it a day. Instead, they repurposed exhaust pipes and tool boxes, turning them into countertops and lighting fixtures. Performances throughout the night were eclectic and a bit left of center. Most notable were the aerial acrobatics, carried out by both a male and female gymnast. They performed individually on silk ropes that hung from the high ceiling, and both individually and together on a large hanging ring. A belly dancer and a singer who introduced himself as your gay lounge singer for the evening rounded out the nights entertainment bill. The rest of the evenings music was a bit too all over the place to be truly enjoyable. One minute they were playing out of date, and completely out of place, hits like Dave Matthews Bands Crash Into Me and the next a DJ was playing house music while a female singer screamed into a microphone at full strength. I guess when you try it all, the results are bound to be mixed. The attempt at broad appeal did at least seem to bring out a wide spectrum of NoDa residents, with the whole neighborhood seemingly represented. Ages spanned several decades and, as apparently desired, artists, bikers and bankers stood side by side at the steel-lined bar. According to the owners, there are still plans for the outdoor area. Those plans remain vague, however (I heard an unsubstantiated rumor at one point in the night of a mini skate park). Whatever the ultimate goal may be, a remodeling job does seem in order. As of now, there is only a small porch which acts as an always crowded smoking area. The cramped quarters are at least somewhat improved by a nice view of the Charlotte skyline. 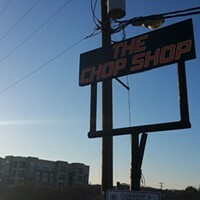 The Chop Shop is just getting its legs beneath it, so it will be interesting to see how it develops and what role it assumes in the new, old NoDa, but it seems to have a good idea brewing. Time will tell if it realizes its large ambition and potential. Heres hoping.